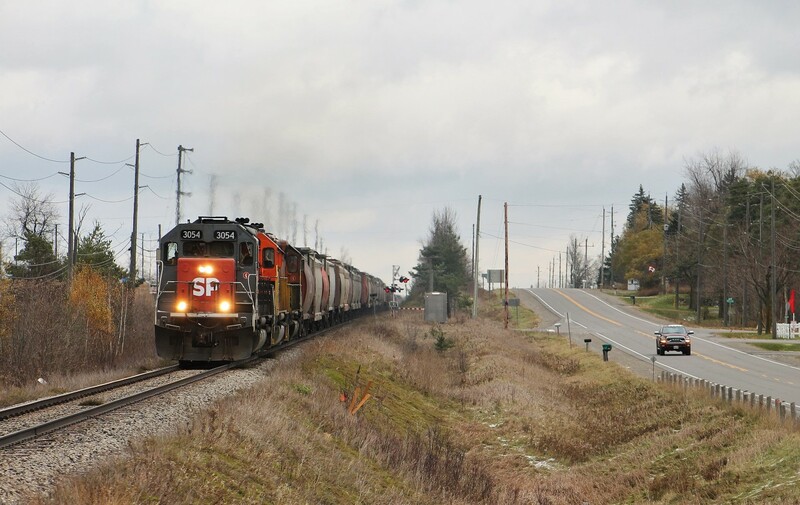 Railpictures.ca - Mike Molnar Photo: GEXR 431 crests the hill at Acton, ON. as a Dodge Ram paces the train on parallel Ontario Highway 7. Some courageous artist(s) (or vandals depending what side of the spectrum you’re on) painted “SP” on the nose of 3054 the night before; partially restoring/preserving the unit’s previous history. With only four more days before this section of GEXR’s operations are taken over by CN (as of this upload), many will be flocking to get a glimpse of an SP tunnel motor in Southern Ontario before another chapter in Ontario rail history closes. | Railpictures.ca – Canadian Railway Photography – photographie ferroviaire Canadienne. Caption: GEXR 431 crests the hill at Acton, ON. as a Dodge Ram paces the train on parallel Ontario Highway 7. Some courageous artist(s) (or vandals depending what side of the spectrum you're on) painted "SP" on the nose of 3054 the night before; partially restoring/preserving the unit's previous history. With only four more days before this section of GEXR's operations are taken over by CN (as of this upload), many will be flocking to get a glimpse of an SP tunnel motor in Southern Ontario before another chapter in Ontario rail history closes. GEXR bought the unit from CIT (CEFX) so that might be where the confusion came from. I’ll go with Mike’s “courageous artist(s) or vandals” quote. Sounds like you caught wind of a foamer fib, Brad. I would love to stand corrected if there is any validity to those claims though. Some folks are saying the ‘SP’ hood unit was on lease, going back to the original owner and that the original Southern Pacific logo would be restored on the side. Leased from whom is the question. I hardly think Union Pacific. Can anyone clarify?